Want to get into the holiday spirit, instantly? Kick off your family holiday celebrations with a visit to the Disneyland® Resort where the lights, scents and color immerse you in the spirit of the season. Enjoy these “don’t-miss” sights and learn a few festive facts about what makes Disneyland® Park the most sparkly place on Earth. The Disney holiday magic begins lighting up the Park on November 10, 2017 and runs until January 7, 2018, which makes a visit the perfect holiday gift for the entire family. 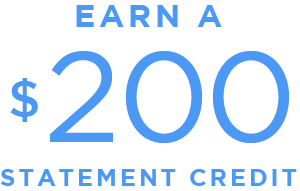 To give the gift of a Disneyland® Resort vacation experience, and for more gift ideas, visit The Gift of Disney Vacations. Start a holiday visit by snapping a family photo beneath the shimmering boughs of the traditional 60-foot Christmas tree in Town Square on Main Street, U.S.A. The awesome tree boasts 2,000 ornaments, 800 bows, 4800 multi-colored lights and 70,000 mini white lights. 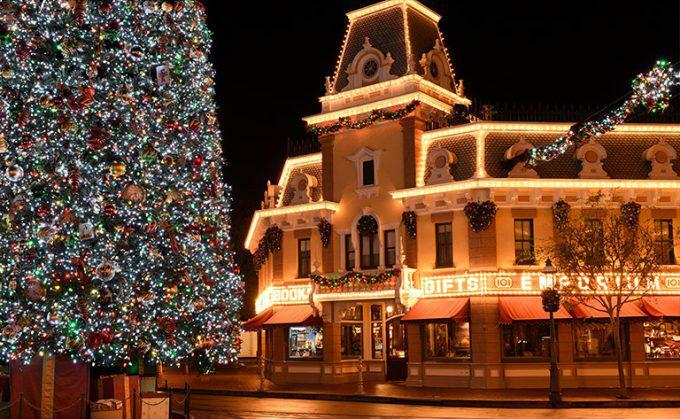 Main Street, U.S.A., inspires us with the warmth and nostalgia of the holidays. Decorated with approximately four miles of ribbon, over two miles of garland and 200 wreaths, Main Street, US.A., will delight the senses as costumed carolers fill the air with music and delicious scents of traditional holiday treats waft tantalizingly from nearby candy stores and bakeries. Go ahead and indulge in the handmade candy canes and the Peppermint Stick ice cream served in a crushed candy cane waffle. Yum! Beautifully decorated shop windows tempt you to enter and use your Cardmember savings of 10% off select merchandise of $50 or more when shopping for the perfect holiday gift.1, 2 And don’t forget to pick up a special Christmas ornament to commemorate your visit. 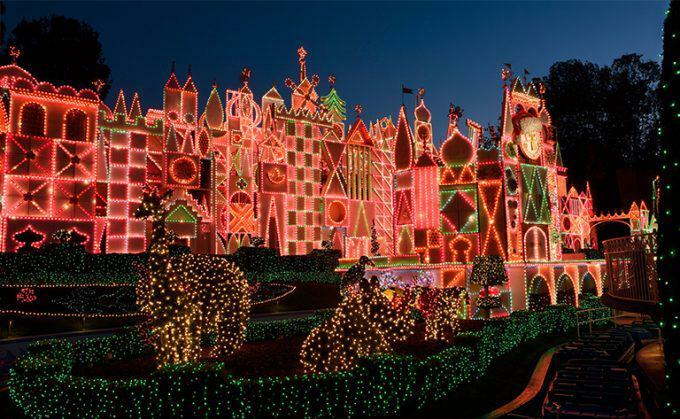 Stop by “it’s a small world” every evening to see the exterior light up in a spectacular show of laser projections, music and twinkling lights. Did you know that “it’s a small world” was the first Disneyland® Park attraction to be decorated for the holidays in 1997? More than 60,000 colored lights and 20,000 clear lights gleam on the exterior façade while 250,000 mini lights twinkle in the trees, topiaries and hedges. That’s a lot of bling! Take time to enjoy the wonder of Sleeping Beauty Castle which is transformed into a winter wonderland complete with snow-capped turrets and towers embedded with 215,000 lights. Be sure to experience the twice-nightly “Believe…In Holiday Magic” Fireworks Spectacular which ends with snowflakes gently drifting down much to the delight of Guests young and old. All this fun is just the tip of the tree when it comes to holiday wonder at Disneyland® Park!